Echinacea & Goldenseal Plus - 2 oz. Individually, both Echinacea and Goldenseal are viewed as beneficial in supporting the body’s healthy overall immune function. When combined, a unique synergism occurs that makes this one of the most effective supplements available to promote optimal wellness. 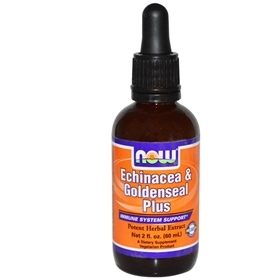 Echinacea and Goldenseal are both popular herbs native to North America and Europe. Echinacea is the most well-known of medicinal herbs, and many studies confirm its effectiveness. For maximum effectiveness, take it with the first symptoms of infection, preventing it from taking hold. Once an infection has invaded the body Echinacea can help to shorten the recovery time. In comparison with antibiotics, Echinacea works by stimulating our own immune system, where antibiotics destroy both harmful and beneficial bacteria. Using Echinacea instead of antibiotics your immune system becomes better able to deal with infections and viruses. Research has shown that Echinacea boosts the activity and function of cells which are called Natural Killer (NK) cells. Echinacea has been known to have some restorative qualities and medicinal uses. Modern research has shown the potential for echinacea as a tool for fighting viruses and keeping the immune system healthy. Echinacea is most commonly used to ward off the common cold. It can be used to treat a range of illnesses, such as fever, cold, flu or viral illnesses, as well as some kinds of infections. Researchers say that echinacea can help boost the immune system by fighting off virus microbes. It is also said to have anti-inflammatory properties. Some herbalists and others call echinacea a “blood purifier” and refer to phagocytes, natural elements that the body develops to combat viral microbes. Experts claim that echinacea can help the body produce these phagocytes. Echinacea is particularly effective in helping to resolve recurring infections, such as ear infections. When used for a few weeks, echinacea's immune-boosting compounds accumulate in the body, making its immune-boosting effects cumulative. Topically applied, echinacea can dramatically speed wound healing, so it's often used for the treatment of slow-healing wounds. It also helps to relieve the pain of the wound and can protect slow-healing wounds from infection. Echinacea is also frequently used as a hemorrhoid remedy, and is often added to over-the-counter hemorrhoid medications. Echinacea helps protect your healthy cells from invasion by bacteria and viruses, even if you apply the herb topically. This means you can use it to keep cuts and scratches from getting infected. Not only will it keep the wound from getting infected, but it will speed the healing process. When used externally as a topical disinfectant, echinacea also has analgesic properties. Goldenseal fights infections, but there are so many other benefits that it has been called the "universal herb". It is a general tonic for the mucous membranes, and used to treat colds, flu, ulcers, sinus conditions, dyspepsia, worms, bowel irregularity, gonorrhea, vaginal infections, and other uses. Suggested Useage: As a dietary supplement, take 1 to 2 droppersful in tea or water 1 to 4 times daily as needed. Consider taking this product in combination with NOW® AlliBiotic CF™ and Immune Renew™. Caution: Continuous high level consumption of this product for more than 2 weeks of each month is not recommended. Not to be used by pregnant or lactating women unless recommended by your healthcare practitioner. Keep out of reach of children.